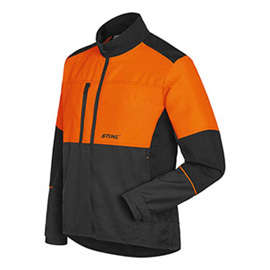 Features large areas of high-visibility orange for improved safety, breathable material that is very comfortable to wear, available in anthracite, black and high-visibility orange. Two side pockets and a zip pocket at chest height to enable a smartphone or first-aid set to be stored safely. Freedom of movement at the shoulders and back, robust material on the shoulders and elbows. Ventilation inserts, large STIHL logo on the back. KWF Utility Value test currently pending. Sizes S – XXL.